Thanks for the reply. I'm almost certain I'm going to go with (2) Dayton Sub-1200's. It has got to be better than my Samsung flat screen's speakers while my Onkyo receiver gets worked on. Once I get the receiver back, I should have both the Daytons set up and ready to go. I've listened to a couple of soundbar/ sub combos recently in much bigger rooms, and if the Dayton's sound as good or better I will be ecstatic. I've been without my 5.1 for six months now and have been relying on my flat screen speakers for my listening pleasure, lol. I think I will be happy with this. Btw, once my receiver gets back from repair, I will have my Bic DV DV84 fronts, and DV-62CLRS center channel operating. While what I have is nothing extravagant, I'm excited to get back in this. I'm sure you will be happy with them, however make sure you take the time and effort to set them up correctly and place them in the room where they will sound the best. a poorly placed sub no matter the cost will sound boomy and one note or have room node cancellations that Will make it sound weak. I have 2 of these and for the money they are good. in my room i tried to place them in one of the recommended positions, in diagonal corners and and a couple other ways. to my surprise they sound best stacked about 3 feet from the front corner of my room. also having your couch against the back wall is not ideal, but sometimes i know the room dictates placement of everything. have fun with them if you do get them. Thanks for the reply. My living room is really difficult and really has no true corner. 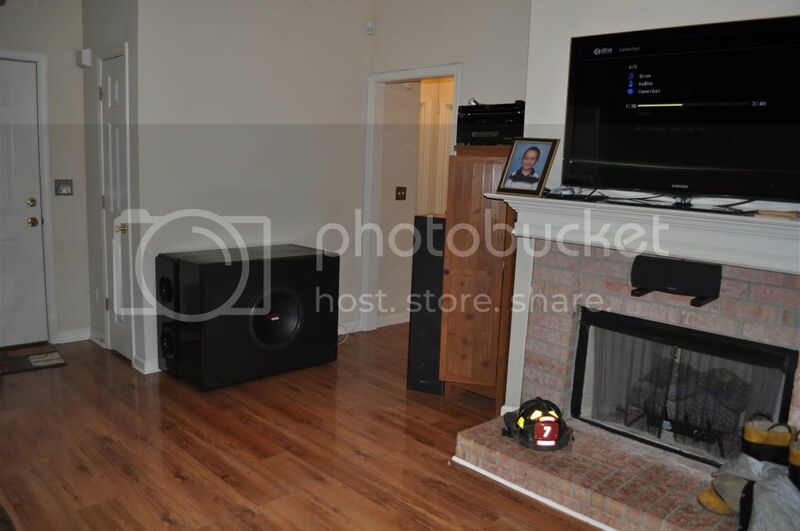 The TV is placed above the fireplace on the mantle, and that section of the wall (6 feet) juts out from the actual wall into the living room, 3 feet, because it is a fireplace. There is 3.5 feet of wall on both sides of the section that justs out, and door ways to bedrooms on each side of that where that side of the living room wall ends. Inside those doorways are 4 ft x 4ft mini hallways with 8 ft tall ceilings going to the bedrooms. The couch on the opposite wall of the TV is 7.5ft from the TV, so there isn't much room to scoot it away from the wall. On each side of the couch, as I might have stated above, are doorways, one being 4 ft wide going to the kitchen, and 3 ft wide going to the dining room. On each side of the couch between the doorways is about 2 ft of the back wall. On the left side of my listening position (couch) on the other side of the doorway is a 4ft nook that goes outside the listening space to the front door. In summery there are basically doorways in every corner and it seems my only option is the mid walls to the left and right of my listening position. I know it might be hard to follow with me describing it and a diagram would best help get an understanding of what I'm faced with. It seems that i made a diagram on sketchup when I designed the enclosure for my one 18 I ran. I will try to find it and post in the thread. Thanks for your advice. Here is one angle showing the fireplace an one hallway going to bed rooms that I was referring to, as well as the front door. The opposite wall from that sub is straight going to the doorway to the kitchen. I'm appologize, but I feel like I have hijacked this thread enough and will start my own. im surprised a bit about this review.i to was thinking piece of junk,but i guess not.it has a larger brother you know hmmmmm interesting. Going into the review I wasn't really expecting all that much. Honestly, how much effort could PE have put into something that costs what the SUB-1200 does? Turns out somebody did their homework, and for the price it's almost a no-brainer (assuming you can forgo the really low stuff). I have no problem recommending it. any chance of reviewing its big brother? There's nothing currently planned, but never say never. Well, I know the review is glowing but the frequency graph looks like this is a one note wonder to me. looks like it has a relatively flat response to me from 100 to 25hz give or take. it is not the greatest sub but does pretty good set up properly.